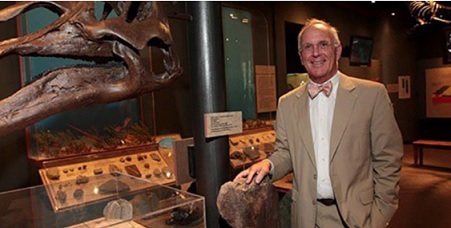 Jeff Chapman, director of UT’s McClung Museum of Natural History and Culture, will retire at the end of the 2019 spring semester after 29 years as the museum’s director. Under Mr. Chapman’s leadership, the McClung Museum has established itself as central to research, teaching and interdisciplinary programming at UT, officials said. The only museum on the university’s campus, it has hosted classes for thousands of students, received five accreditations by the American Alliance of Museums and welcomed more than 1.4 million visitors since its opening in 1963. Today, there are about 25,000 objects in the museum’s arts and culture collections from around the globe, and its research collections in archaeology, paleo-ethnobotany, and malacology hold millions of specimens. Chapman, who was honored with the 2018 Chancellor’s Extraordinary Service to the University award, has overseen much of the museum’s growth. In addition to his role as museum director, Mr. Chapman is a research associate professor in the Department of Anthropology. He arrived at UT in 1975 to work as an archaeologist on the Tellico Reservoir Archaeological Project. Previously, he spent six years teaching history and anthropology at the Webb School of Knoxville. Mr. Chapman holds a bachelor’s degree from Yale University, a master of arts in teaching from Brown University, and an MA and PhD in anthropology from the University of North Carolina, Chapel Hill. Since transitioning into his role as museum director in 1990, Mr. Chapman has spearheaded the expansion of the museum’s permanent collections in anthropology, geology, archaeology, human origins, history, decorative arts, ancient Egypt and natural history. He also initiated both K–12 and university academic programs at the museum, created a membership program and increased research activities. In 2015, museum supporters established the Jefferson Chapman Endowed Directorship to be used in finding, maintaining and supporting the new director and advancing the museum’s priorities such as research, exhibition and public programming. The goal is to raise $2 million in gifts and pledges. Dean of Libraries Steve Smith will chair the search committee for the new museum director. Mr. Smith administers the John C. Hodges Library and two branch libraries, with an emphasis in music, social work and agriculture and veterinary medicine. Members of the search committee are Denise Phillips, associate professor of history, College of Arts and Sciences; Suzanne Wright, associate professor of art, College of Arts and Sciences; John G. Peters, head of the McClung Museum Advisory Board, former UT provost and senior vice chancellor, and president emeritus of Northern Illinois University; Jacob Rudolph, associate vice chancellor for marketing and communications; David Butler, executive director, Knoxville Museum of Art; Sharon Pryse, CEO and founder, The Trust Company; Tim Baumann, curator of archaeology, McClung Museum; and Cat Shteynberg, assistant director, curator of arts and culture collections and head of web and media, McClung Museum.